The Star Wars podcast that I do with John Mills is doing a review contest on iTunes. We are offering an ultra exclusive t-shirt to the winner. All you need to do is leave a star rating and review for the show in iTunes (only open to the US) to be entered in the drawing. Even those who previously wrote reviews will be entered. You’ll get the awesome shirt pictured here in your size. All for about 2 minutes to help out our show! Please share with as many people as you can and best of luck! Contest ends May 1st. This entry was posted in Podcasts, Star Wars, Uncategorized and tagged Aggressive Negotiations, contest, iTunes, Podcasts, Star Wars, Star Wars Rebels, The Clone Wars on March 2, 2017 by mrushing02. This entry was posted in Star Wars, Star Wars Rebels, The 602 Club, Trek.fm and tagged Disney, Podcast, Review, Star Wars, Star Wars Rebels, Television, Trek.fm on June 25, 2015 by mrushing02. It has been a tough start for the new Star Wars book line. A New Daw began things perfectly by telling a story that introduced us to Kanan and Hera of Star Wars Rebels. It chronicled their first meeting, giving us our first canon book as well as our first taste of these new characters. Tarkin followed and unfortunately felt like little more that filler which is more than can be said about the dismal Heir to the Jedi. A seemingly promising start has been watered down to stories with little impact on the saga, ranking with some of the worst in the old Expanded Universe. Can Lords of the Sith turn things around? Paul Kemp’s Lords of the Sith is exactly the book I was hoping it would be. It has weight to its story and adds depth to the characters in the tradition of the best tie-in fiction. The story follows Cham Syndulla, Hera’s father, as he uses all of his resources to take down Vader and the Emperor who are traveling to Ryloth on their own mission to root out traitors in Orn Free Ta’s delegation. Kemp is able to add so much to our understand of Vader, his growth as a Sith as well as his relationship with Palpatine. It’s the thing many readers have expected from this new line of books, that they would add something legitimate to the characters, as well as deepening our understand of what drives them. Lords of the Sith has this in spades, in it’s story of the Sith and the Rebels. 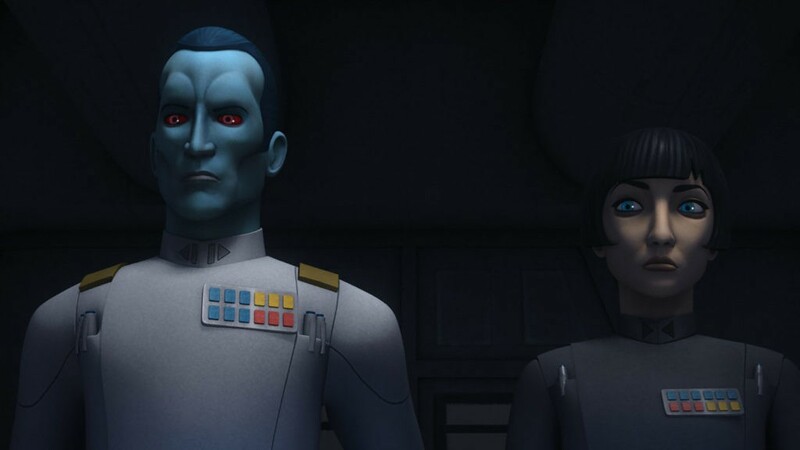 By telling this story of Cham Syndulla we not only have a greater insight into a character first seen in The Clone Wars, but his daughter who is the star of Rebels. Both stories have the impact you’d hope for. There is so much that is worth talking about in this book but that would lead to spoilers that are best left to discovery while reading. So pick up Lords of the Sith and enjoy how the Star Wars new canon books should feel every time you read one, significant. Rated 4 out of 5 Sith Lords. Disclosure: This book was provided by Del Ray as an early review and in no way affects the thoughts or feelings of the reviewer. This entry was posted in Book Reviews, Books, ebooks, Star Wars, Star Wars Rebels and tagged Book Reviews, Books, ebooks, Star Wars, Star Wars Expanded Universe, Star Wars Rebels, The Clone Wars on April 25, 2015 by mrushing02.